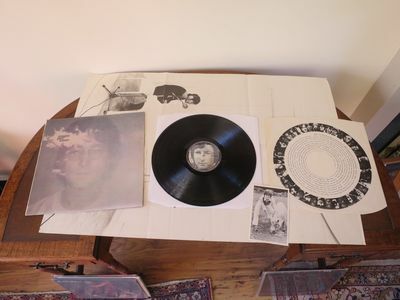 This auction is for John Lennon's superb "Imagine" LP on the Apple Records label PAS 10004. Matrix marks -1U/-1U, FIRST UK Pressing. "PORKY" & "PECKO" etched in dead wax indicating record was cut/mastered by the legendary George Peckham. Vinyl grading is Near Mint according to the Record Collector Grading System. It appears barely played prior to my test plays. A SUPERB "Time Capsule" or "Vault" copy. Test played superbly with wonderful audio and low overall background noise. A FANTASTIC copy! The laminated sleeve and printed inner are in SUPERB overall condition - see photos. The postcard is likewise in SUPER condition. The poster is in excellent condition, just showing a few pinpricks in each corner and some minor creasing. OVERALL, A SUPERB COPY AND VERY HARD TO FIND IN THIS WONDERFUL CONDITION!